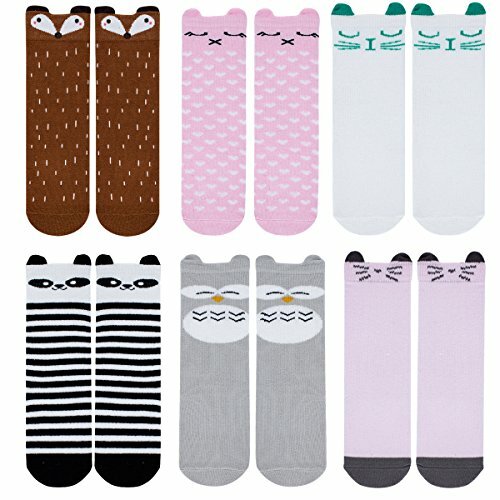 Purforlove cute cartoon pattern knee high socks keeps your baby warm with fashionable look. It has non skid sole,that keep it anti-slip when toddlers wear for walking. Special design various Animal patterns,fruit patterns,etc. full of great fun and joy! -For occasions:Use as photography prop and costume,for casual daily wear,birthday party,baby shower,wedding party,halloween and so on. Cute and stylish with toddler outfit. -Hand wash or machine wash, hang air dry or tumble dry gentle. M: length of sole 4.5-5.2 in/11-13cm,suggest for 2-4 years. The socks Length maybe different between two pairs of the same size socks because of the elasticity of Spandex or the density of textile.The length of the difference is within 0.4 IN normally. Our mission is to give your family pure and comfortable love, by offering high quality and affordable intimate apparel. Welcome to Purforlove!If you are not satisfied with your purchase, you can return it for a replacement or refund.Thank you! If you have any questions about this product by Purforlove, contact us by completing and submitting the form below. If you are looking for a specif part number, please include it with your message.